We focused on two post lifts and in-ground lifts in part one, and spoke about four post lifts and Scissor lifts in part two of our series – Automotive Lift Options. Part three is the final part of this three part series. We will focus on Mobile wheel engaging lifts, Pit Lifts and Parking Lifts. Mobile Wheel Engaging Lifts, also known as Portable Column Lifts are more often used for heavy trucks and large vehicles. They are typically sold in sets of four or six and lift the vehicle by the wheels. They can be rolled around to where you need them, so you don’t need to permanently mount them, and you can store them out of the way when you’re done with them. They are synchronized so they will lift at the same pace. 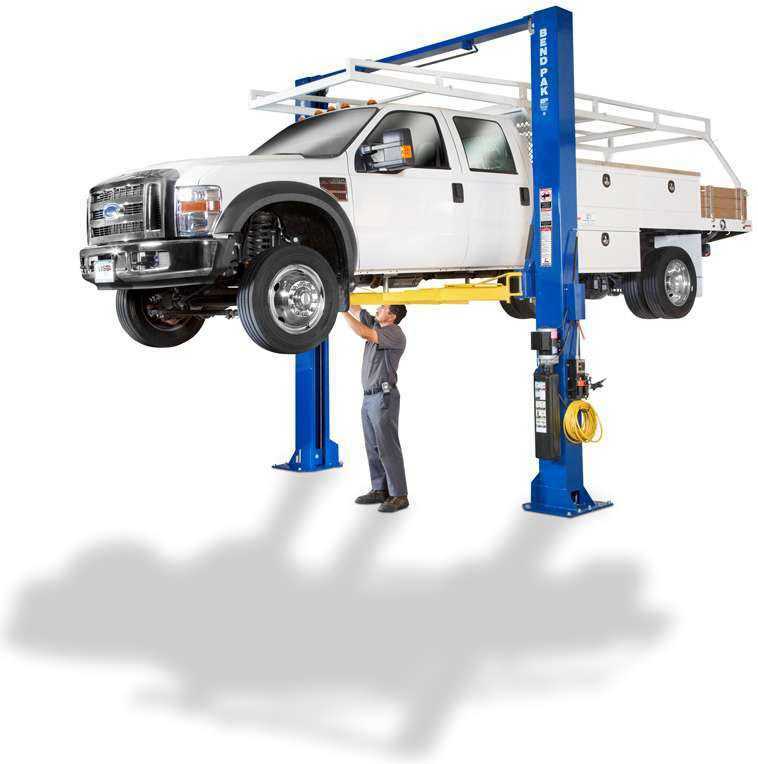 Pit Lifts are perfect for lube shops, but also are popular with the home / hobbyist who just wants a car lift that allows him complete access to the underside of the vehicle. Lube shops love this lift because it straddles their pit and the technician will work from underneath, down in the pit. Oil changes are quick and easy, because you just drive on and off. We all know, time is money. Home users appreciate the ability to get at the underside of their car while still having a low rise lift that will work for their low ceiling garage. Finally, there are many different types of parking lifts / car storage lifts. The most popular parking lifts are Four Post Lifts. These are extremely popular with the home car enthusiast looking for more room in his garage. The four post parking lift is the most affordable option, and can even be portable with the optional caster kit. There are two post parking lifts that are also very popular. These are not like the typical two post service lift. These have runways that you drive up onto. Then there are single post parking lifts. Customers who purchase these lifts get them because they don’t take up all the floor space that those other types of storage lifts do. You just have the one column. Because you’re lifting from only one side, this style of car storage lift requires it to be mounted to an adequate concrete surface. Give us a call and we’ll help set you up with a lift that’s right for you. 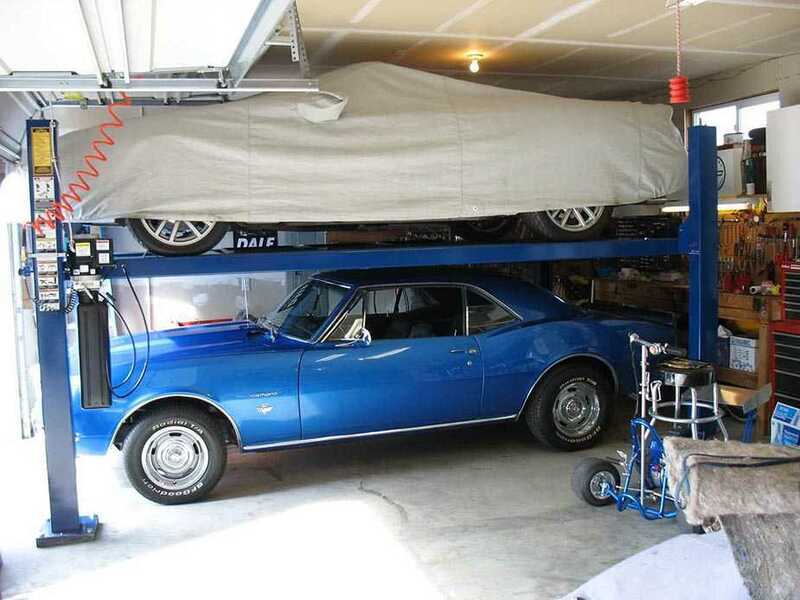 Our previous post began with the different types of Automotive Lifts on the market today. We outlined two different types of lifts – In-Ground Lifts and Two Post Lifts. This time, we will feature two other types of popular car lifts – the Four Post Lift and the Full Rise, Low Rise and Mid Rise Scissor Lift. The four post lift is one of the most popular types of lift because of it’s features. It is a surface mounted lift that you can drive on and off very quickly and easily. It lifts to a full rise and allows access to most of the vehicle. It’s perfect for quick oil changes and for big jobs like transmissions and mufflers. A variation of the four post lift is the four post alignment lift. It integrates turn-plates into the front of the runways and slip-plates in the rear. However if you need access to the wheels for brakes and tire rotation, you will need to get an accessory like a rolling jack. A rolling jack is air powered and rolls up and down the length of the runways to correspond with the car’s jacking points on the frame. You’ll need two jacks to lift all four wheels off the runways. We have Four Post Lifts ranging from 7,000 lb. capacity up to 4,000 lbs. Scissor Lifts are popular for several reasons. One of the main reasons a shop owner or individual will get a scissor lift is because they don’t have enough space for a two post or four post lift. Most scissor lifts take up much less floor space than other types of Car Lifts. They are frame engaging lifts that allow access to the wheels for brake jobs and tire rotations. They are also handy for body work. There are full rise scissor Lifts that allow complete access to the underside of the vehicle. These must be mounted to the concrete. Then there are portable low rise and mid rise scissor lifts. These are very popular with the brake shops and home hobbyists. They don’t have to be bolted down, and you can roll them around to where you need them. They also don’t take up much floor space. Many can operate off of 110 volts AC which is also convenient. Stay tuned for our next installment where we’ll touch on Pit Lifts and Mobile Wheel Engaging Lifts. There are many different Automotive Lift types, styles and designs out there on the market today. Prior to the 1980’s, if you walked into a typical auto shop, you would most likely find an In-Ground Lift. In-Ground Lifts have the hydraulic reservoir located below the garage floor, in the concrete. They typically employ the use of one or more hydraulic cylinders. Some Lifts may be powered by air instead of hydraulics. In Ground lifts are very versatile, and can conform to almost any vehicle configuration. 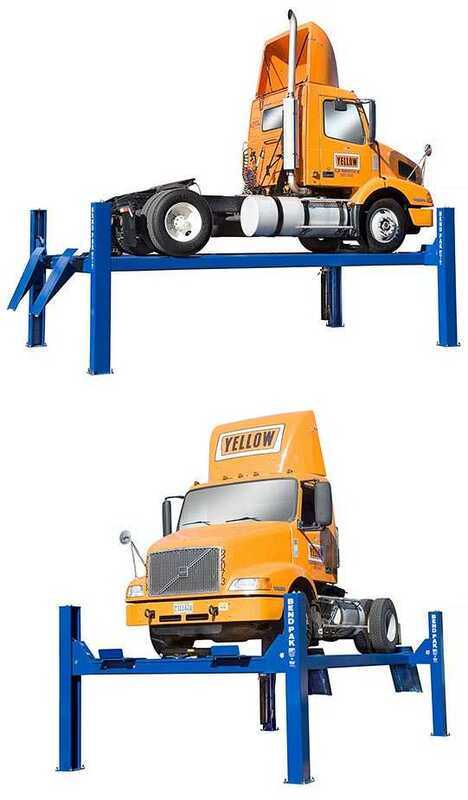 These lifts typically are frame engaging lifts, meaning that they have arms that can be adjusted to conform to meet the vehicles frame jacking points. In Ground Lifts are becoming less popular these days due to the fact that they are more expensive to install, and there are Hazmat concerns if the hydraulic oil begins to leak out of it’s reservoir. These days, surface mounted lifts have become the most popular style of car lift. 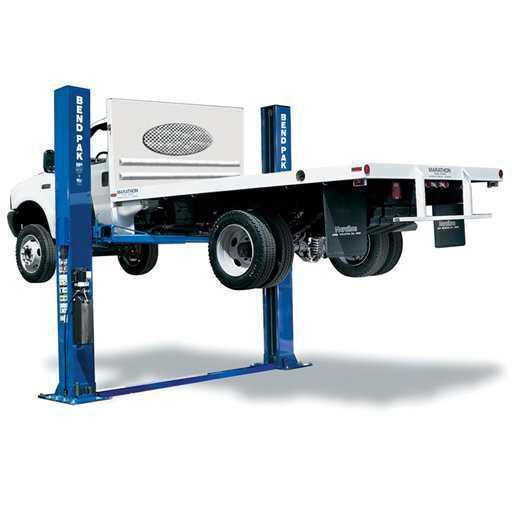 And of all suface mounted lifts, the Two Post Lift is the most common. Two Post lifts are mounted to the concrete floor with anchors. When installing a two post lift, it is vital that your concrete is of adequate thickness and hardness. Most two post lifts are powered by an electric motor powering a hydraulic pump. The pump will then power a hydraulic cylinder located in each column. From there, the cylinder can lift the lift carriage directly, (direct drive lift), or can work in conjunction with a chain or cables. Two post lifts must be synchronized so that they lift at the same pace. These lifts will typically be frame engaging lifts that lift the vehicle from it’s frame jacking points. This style of lift is popular because it is affordable, fairly easy to install and maintain, and allow to greatest access to all of the car for servicing. Most two post lifts are full-rise lifts, meaning they will raise the vehicle to adequate height so that you can stand up underneath it to service the car. Two Post Lifts can be broken down into two categories – Clear-floor, or floor-plate lifts. Clear-floor models have the cross-member at the top of the posts. This cross-member acts as a conduit for hydraulic lines and equalizer cables that must go from one column to the other. Floor plate lifts keep this cross-member on the floor, under a plate, hence the term “floor plate”. These lifts are primarily purchased by people who’s ceiling is not tall enough for a clear-floor model. Floor plate models will typically be under 10 feet tall. In our next post, we will follow with descriptions of more types of lifts. Backyard Buddy has advertised for years now about how their four post lifts are the best on the market. They frequently post pictures in their ads of competing lifts that have failed in a catastrophic way. Well, BendPak decided to add their two cents to the conversation. BB was lumping all home / hobbyist 4 post lifts together as being inferior and having the potential to fail, so BendPak came out with their comparison to BB as an answer. It really hits home too. It points out the many superior features of the BendPak HD9 series lifts over the Backyard Buddy. First and foremost, the BendPak HD9 four post lift is ALI Certified. This is not a minor detail. ALI (The Automotive Lift Institute) is the recognized authority when it comes to automotive lift quality and safety standards. There are only a few home/hobby lifts on the market that are ALI Certified. The Backyard Buddy lift is NOT ALI Certified. The BendPak Lift has features that most other home hobby lifts, (including BB) don’t have, like dual safeties. It has a slack cable safety, in addition to the typical mechanical safety found on most lifts. The BendPak lift has been certified to lift 3 times it’s rated capacity without failure. BB has many exposed cables and working components which means not only a cosmetically undesirable lift, but potential hazards in the way of pinch points. BendPak’s internal ladder locking system also allows you to adjust your locking position heights in the event that your floor isn’t perfectly level. This is not the case with BB. Please remember, just because you pay more for a lift, doesn’t make it better. BendPak can afford to manufacture their lifts at a lower price due to economies of scale. Meaning that because they manufacture so many lifts, they can do so at a more affordable rate per lift. BendPak is a true world leader when it comes to manufacturing car lifts. There are too many more differences to list them all here. Please check out the complete comparison here. Here is a brief outline of why BendPak Two Post Lifts are superior to most other two post lifts out there on the market today. Our Bend Pak Lifts are a smart choice for those who want a top-of-the-line automotive lift, but don’t want to pay top-of-the-line prices. Bend Pak is one of America’s largest car lift manufacturers and produces some of the lowest price ALI & ETL approved two post lifts in the industry. They’re unrivaled when it comes to quality, workmanship, and durability. BP has been around for over 40 years, and we have been carrying them for over 14 years. They are ALI Certified, which means they meet very strict quality and safety standards, and that they were tested not just by anybody, but by the recognized authority on the subject, the Automotive Lift Institute. Most lifts are not ALI Certified. They have top-of-the-line features like triple telescoping arms, (10,000 lb front arms only, and 12,000 lb. all 4 arms). These arms allow you to get at difficult to reach jacking points that you may not be able to get at with the standard two stage arms that most lifts have. They have larger equalizer cable pulleys that allow the equalizer cables to last twice as long. Plus the pulleys have three times the bearing surface area, which makes them last three times as long. They have better arm restraints, and are just heavier duty, (they weigh several hundred pounds more than the typical two post lift). They also have the preferred direct-drive lifting system, (clearfloor models) that is not only safer than cable or chain drive, but will save you money in the long run on expensive wear parts like cables, chains and pulleys. They have taller lift carriages, (53″) which means less stress on the columns. The cylinders operate on a lower pressure, which means you won’t need to change the seals as frequently. They also have a superior warranty, which is 5 years on structure, one year on power unit and one year of on-site service, so if you have a warranty issue that cannot be resolved by simply troubleshooting by phone, sending you out the parts and talking you through installing them, they will send somebody out on-site if necessary. The asymmetric models can also position the vehicle symmetrically as well, so you get the best of both worlds. This can be handy in those situations where a certain vehicle (typically longer, or rear-heavy vehicles) don’t balance out the well asymmetrically, and you need to move the vehicle forward more to help balance it out. You simply won’t find a better quality Two Post Lift at a lower price – period. DOES IT HAVE A CERTIFIED TANK THAT MEETS ASME STANDARDS? All of our BendPak TRI-MAX™ extreme duty compressors from BendPak feature 80-gallon tanks manufactured by Manchester Tank, the world’s premier manufacturer of pressure vessels, founded in 1946. 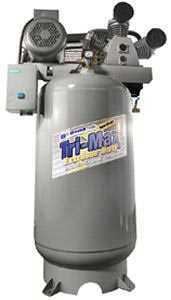 No matter what Air Compressor you get, make sure it has an ASME compliant tank. SHOULD I GET ONE STAGE OR TWO STAGE? into the other and then into the air tank. Typically, a two cylinder two stage compressor has a larger first stage which then pumps air through a cooling tube and into the smaller second stage cylinder at about 90 PSI, and then into the tank at 175 PSI. 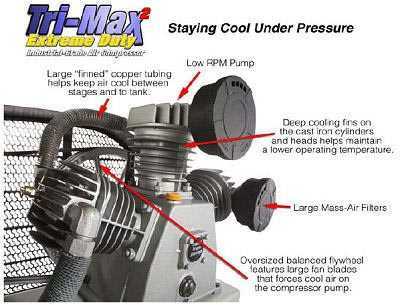 The reason for purchasing a two stage air compressor is if you need higher pressure. Most commercial auto shops will require a two stage compressor. WHAT ABOUT DIRECT DRIVE OR BELT DRIVE? size. A large piston moving at the same RPM as a smaller one will put out a higher CFM. Inferior, cheaper air compressors usually have a higher RPM rating because their pumps are frequently significantly smaller than a comparable industrial model. Remember, higher RPM builds up more heat than a slower RPM. Typical industrial grade air compressors are splash lubricated. Which means they have “flaps” on the connecting rods to splash oil up in the crankcase. As long as there is an adequate amount of oil in the crankcase, splash lubricated pumps will last a long time. Many of those cheaper direct-drive compressors you see out there are oil-less. This means they don’t use oil to lubricate the piston inside the cylinder. Think about it. Imagine your car engine running without oil. Oil-less compressors typically use cheap aluminum cylinders, heads and pistons to help dissipate the heat. Aluminum does help dissipate the heat, but it warps and wears out much faster than cast iron. Oil lubricated compressors are also much quieter. Oil-less air compressors are much more noisy because they don’t have oil in the pump to “muffle” the sounds. 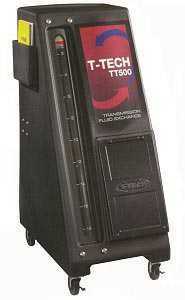 ASEdeals.com announces a huge sale our our TTech TT400 and TT500 Transmission Fluid Exchanger Machines. If ever there was a time to purchase a Transmission Fluid Exchange Machine, now is that time. For a limited time, we have a HUGE sale on our TTech transmission flushers. This is not a typo – You can get up to $1200 off, depending on the model. That’s right, $1200 off! This is an unprecedented sale. These aren’t demo models, or scratch and dents. These are the same brand new top of the line machines we’ve been selling for 10 years now. The TT400 is currently $800 off it’s regular price, and the TT500 is currently $1200 off it’s regular price. But let’s not stop there. We’re also adding a handy Fast Fittings and accessory kit for free as well. The FastFit fittings and accessories assortment includes all FastFit service hoses and fittings to allow you to speed job set up and vehicle turn around times. It includes two service hose adapters, a 90˚ coupler and 15 FastFit fittings to service a wide variety of late model vehicles. This sale almost sounds too good to be true. But luckily for you, it is not. But you do have to hurry. This sale can, and will end at any time. You are currently browsing the Car Lift Blog blog archives for September, 2010.